After moving to a new house in Norfolk, we had some problems with the internet connection. 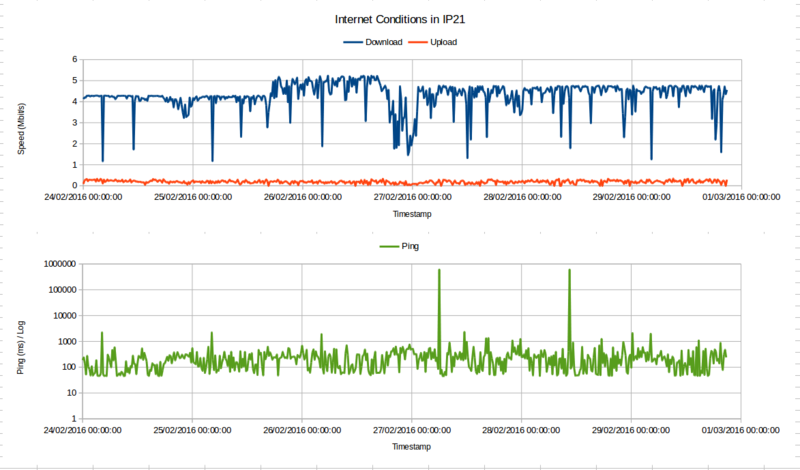 After we got the initial dodgy cable connections out of the way, I wanted to monitor the internet connection service for a while. I decided to make a simple script to monitor test the connection, and use cron to call the script regularly. The script would also need to append the latest test results to a file. There was some interest on Twitter about the script and how I managed to get this working, so I decided to write it up here, as people seemed interested. This is not a thorough explanation, but a working example. I suppose many of you are familiar with SpeedTest.Net. My first thought was to run a test with that, and scrape the HTML output from the page. While looking if it had been done before (never reinvent the wheel) I came across a command line interface to SpeedTest.Net, called speedtest-cli which can be found on github here. To force the test to be done with a specific server, you run speedtest-cli –server 6151, for example. The only other useful command is the –simple flag which reduces the output to just the test results. These can then be parsed by a shell script and saved into a log file. From here, we can write a script to log these results. The above script is saved as /home/george/speedtest-cli-save and when run, appends the test data to the end of the file /home/george/speedtest.txt which is a CSV file. To perform regular periodic sampling of the internet speeds, I use cron to initiate the speedtest-cli-save script, and thus the test. This executes the script every 15 minutes, every hour of the day, every day of the week, every month. The resulting CSV file, here, /home/george/speedtest.txt, looks something like this, depending on your Internet measurements. By opening the CSV data or copy/pasting into LibreOffice (or Microsoft Excel, etc. ), you can graph the results as a function of time. Care should be taken when formatting the date and time, especially on longer runs. You can see here that the upload is pretty poor, and the ping very variable. From this data, it is easy to use standard office skills to generate an X-Y scatter graph showing the bandwidths and ping, such as below.